It is fundamentally confusing that 1943’s Heaven Can Wait shares a title with the 1978 remake of another movie entirely (1941’s Here Comes Mr. Jordan). That this strange error exists makes for a confusing legal argument, considering that the newer movie should have run into copyright issues at the very least, and makes for a confusing cultural argument. Why would a studio want an audience to seek out a completely different movie? Here Comes Mr. Jordan was itself based on an earlier stage play called Heaven Can Wait, but early studio executives decided to rename it. When remade it took the play’s original title. 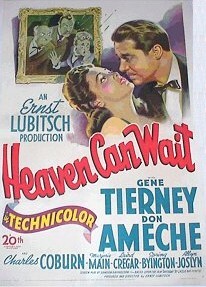 Even more confusing: 1943’s Heaven Can Wait was itself based off a play called Birthday, whose studio execs decided to change its name to Heaven Can Wait, even though there already existed a play of the same name and the movie minimal narrative ties to it. We can only assume that the studio was not too worried about audiences mistaking these two pieces, the intellectual property laws that guided the convention of copyright were looser or perhaps less strictly enforced, or neither of the above. Perhaps no one bothered to check or, more likely, this wasn’t an issue. But these facts seem to be merely inconvenient: there has been no attempt to “correct” the nomenclature in the last 40 years. And besides the loose narrative ties (both plays deal with a person of questionable character waiting in some sort of Muzak purgatory) the stories share no pertinent details. This phenomenon is not unique to the legacy films either; modern film has seen this happen in two distinct ways. First, constant series reboots make the intellectual property malleable. Every six or so years Spider Man has sought to redefine itself with a more modern take (some would argue a truer-to-the-comic version) on the radioactive spider hero. This phenomenon also doesn’t apply to sequels whose economies of scale decrease seemingly exponentially for studios who are looking to profit (read: all of them) on established universes, familiar characters, and trite, universal storylines. Neither of these phenomena are horrific for film, but they seem to take up a lot of bandwidth and make it increasingly challenging for independent filmmakers to create films that move an artistic needle. Rarely do or will sequels or reboots stand in Best Picture conversations. The populism vs. auteurism and what matters debate is too broad for this take on Heaven Can Wait. The second, memorable instance is between 1996’s Crash and 2004’s Crash. Like 1943’s Heaven Can Wait and 1978’s Heaven Can Wait these films share a title and a meta-analytical bad dream for search engines. Unlike the older duo, however, the newer films could not be further apart ideologically. The newer one reigns popularly supreme, having won Best Picture in 2004 for its Traffic–style populist take on a cross-sectional race analysis. It was the first and will most likely be the last film to appeal so nakedly and so cloyingly to its race-baiting themes, and for good reason. David Cronenberg’s Crash is a postmodern analysis of literal paraphilic auto-eroticism, and could not be ever considered acceptable (nor should it) for Best Picture honors. Best Picture cannot, at least for this iteration of American auteurism, be awarded to a film so postmodern. Any film like this just won’t have the pop-modernist take on the American cross-section, so it will be deemed too indie or too provocative for the race-to-the-center that is Best Picture, for better or worse. It is curious that both Crashes exist in the same universe because the older one would seem to undermine the newer one, unlike the classic films from the 40s and 70s. On a cursory search, that the films share a title doesn’t seem to be of much interest to critics or lawyers alike. Perhaps the fair use doctrine applies here because the word itself – “crash” – is particularly innocuous: it is much harder to imagine a 2019 film called The Lord Of The Rings, be released without controversy, especially if it is released outside the Tolkien universe, and is instead about a gold purveyor. Cue lawsuit. This is a curious case; they are both curious cases that will have stood the test of time. Both Heaven Can Waits are nominated for Best Picture in their respective years; neither won (unlikewise: only 2004’s Crash is nominated for Best Picture and it did, perplexingly, win over Munich, Brokeback Mountain, and Capote. This year is up there in the overall conversation about questionable decisions). Nineteen forty-three’s version of this movie packed a particular punch because of Don Ameche’s and Gene Tierney’s heartwarming takes on their roles, respectively. Charles Coburn is particularly likable as Ameche’s screen grandfather and adds a branded humor throughout the film, as to anchor it in its place as comedy-drama, rather than dramatic-comedy. This was a memorable decision, and makes this film a fun, meaningful watch. It never had a chance against Casablanca, and it probably shouldn’t have. Of the ten nominees that year, Casablanca will always be the oft-remembered film (of the films nominated) probably with or without its win. Remember 1943 was a conflict-year for the United States and Hollywood produced a trove of propaganda-leaning films to inspire the war effort. Like Mrs. Miniver the year before, Casablanca worked to humanize civilians affected by fascist aggression, and does so admirably and with all-time performances from Humphrey Bogart and Ingrid Bergman.